We are here today in Ouvea, the most Northern island of the Loyalty Islands which are part of New Caledonia. 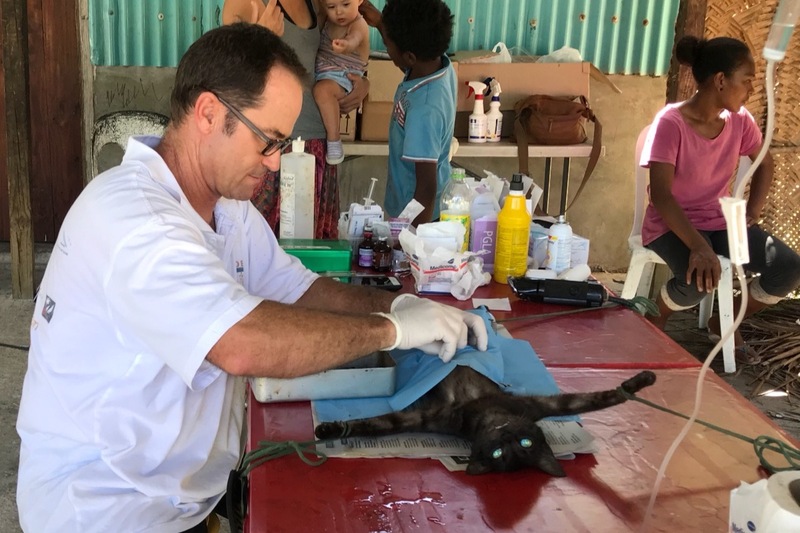 A team of people comprised of a veterinary Guy Kane, the Society for the Protection of Animals and us, Brent and Ana of Catamaran Impi are helping to take care of domestic animals. Normally there is no veterinary on the island so we have come across all kinds of ailments and injuries. Most frequently though we need to help the locals with controlling the numbers of cats and dogs by sterilization. This costs about $50 per animal. We, Catamaran Impi, provide accommodation, food and transport for the rest of the team, and promote their cause. Guy as a qualified vet is in charge of operations and is ably assisted by Marie Martin, president of the Society for the Protection of Animals in New Caledonia. In 4 days we have been able to help some 70 animals and we have now been asked to help the two other Loyalty Islands, Lifou and Mare. We hope to conduct these campaigns in January and May. We are appealing to all sailors who enjoy the beauty of these islands to contribute a few dollars or pounds towards helping the local people here who have no access to vets, but are super kind hearted and who try to take care of their animals in the best way they can. The sea is super blue here, there are smiles on all the people's faces, let's just make that smile a little wider by Helping them to Help Animals. This campaign is a tribute to our Abandoned Island Dog Moose, who started our animal welfare campaign in New Caledonia. We are supported by the Down Under Rally Go East whose cruisers make a donation to our cause.